I started working with podcasts because I was an avid podcast listener. I would be listening to a conversation, hanging on every word, and then it would happen: the guest would bump his mic at the exact moment when he said the one thing I wanted to hear, and I’d miss out. Our content should connect and engage, not frustrate and push away. Since I run a podcast production company, I’ve learned that most people think any sound problem can be repaired with the simple twist of a knob. If only that were so. Do you know how to avoid the most common podcast production pitfalls that distract your listeners? Read on to discover how your podcast can stand out from the majority of the audio content available on the web. Audio quality can be as subjective as Picasso’s art in a museum. One person says it’s brilliant … the next walks away scratching their head. Let’s start with what quality audio is not. Other foreign sounds: animals, lawnmowers, keyboard clicks, etc. On the other hand, quality audio can be defined in one word: natural. Quality audio sounds as if you’re talking around a kitchen table or with a client in your office. 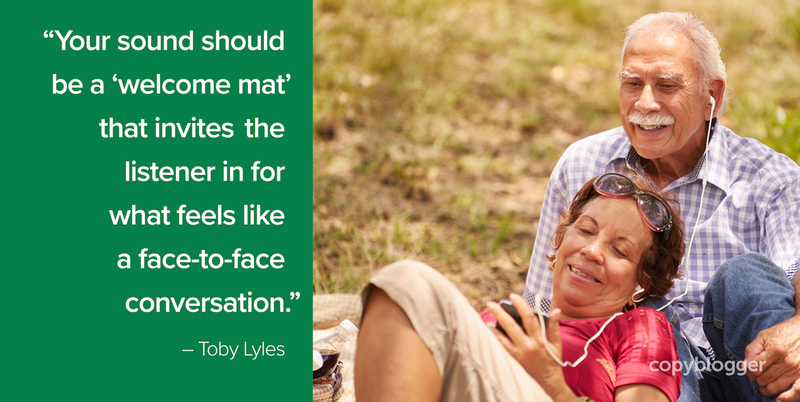 Your sound should be a “welcome mat” that invites the listener in for what feels like a face-to-face conversation. How do you accomplish that? Here are 10 tips that will help you produce the “welcome mat” experience. Podcasts and blogs are similar. In the same way that good website design helps attract and keep blog readers, quality audio attracts and keeps listeners around. Quality audio isn’t about making you sound good, it’s about engaging your audience. Microphones are the most important element of quality audio, but podcasters don’t need fancy, expensive ones. If you record a monologue or interview-style podcast in an office or room in a home, a dynamic microphone is what you need. Other microphones work, but they can require more resources to coax out good sound. The microphones listed above will produce quality sound, but remember that choosing a microphone is mostly about personality and taste. You need to ask yourself if the microphone is right for you, your voice, and your brand. One way to answer the “which is best for me” question is to book a session at a professional recording studio and try out a variety of microphones. Take those recordings and get some feedback. Between the engineer at the studio and your friends and family, you should be able to find a clear winner. Also, keep your target audience in mind. Does the microphone help communicate who you are? Does it match the tone your audience needs to hear? The headset microphone that came with your smartphone. While those are great for appearing live on Facebook, they’re not ideal for podcasting. A condenser microphone. They’re made for the acoustics in big, fancy, recording studios. Unless you’re planning to build a recording booth in your garage, leave these microphones in the store. Some podcasters like to record with the microphone in their hands. Unless holding the mic is absolutely necessary, avoid that technique. Another common microphone-stand mistake is connecting it to a surface your hands or feet easily touch. If it’s a desk-mount stand, try connecting it to a nearby piece of furniture that’s not touching the desk. Or, if it’s a floor-mount stand, make sure the feet rest on carpet or padding. Otherwise, the small movements you make during recording can transfer up the stand and into the microphone, which produces distracting sounds. This item alone is a quick win for good sound. Before you record, double-check that your room doesn’t reflect your voice back into the microphone. Carpet, furniture, wall decorations, and non-parallel walls all help calm the reflections. Trying a smaller room, or even a closet, is often easier than acoustically treating your current recording space. Nearly everyone shies away from the microphone. Don’t. Even a slight distance from a mic makes you sound like you’re in a cave. You’ll want to nearly kiss it. Make it your friend, and it will make you friends as you build your audience. “Plosives” are simply the air from consonant sounds disrupting the sensitive components of the microphone. The pop filter, a screen that goes around or in front of a microphone, is a tried-and-true solution. Expensive or cheap, they’re all about the same. Although many recommend using a mixing board, I’ve found that the never-ending knobs create more headaches than freedom. The simplest solution is to plug your microphone into an audio interface, which converts your analogue microphone sound into digital, so your computer can understand it. As a side note, even if you’re using the Audio-Technica 2100, it’s still a good idea to utilize an audio interface instead of the USB connection. It produces a much more detailed and clear sound. Take advantage of multiple tracks to make sure every voice has its own separate recording. With a two-person interview, it’s easy to pan the host to the left track and the guest to the right track. If your guest joins you via video chat, capturing a separate track of their local recording is helpful. In the past, this was only possible if the guest was well-versed in audio or recording in a radio station. Thankfully, technology has advanced. One of my favorite tools is Zencastr. It records via a web browser and uploads the best audio possible to your dropbox account. Some people prefer to avoid a computer and record into a small recording device. I often do this myself, after having one too many recording sessions ruined by computer glitches. I know of an author whose power went out while he was recording an audiobook. He lost four hours of recorded audio! You can avoid that exact situation by recording into an external recorder. Or better yet, record into a computer for convenience and add an external recorder as a backup, just in case. One of the fastest ways is to simply use an XLR splitter, which will split the signal into both the audio interface and the external recorder. If you have multiple sources, running an output from the interface into the recorder is a great way to use it as a secondary backup. While creating a good recording is the bulk of what’s involved in producing a podcast, quality editing and production wraps up the package. If you have audio experience, go for it, but if you’re hesitant, grab someone who’s spent some time in the field. Even if you don’t hire a producer who specifically works with podcasts, their wisdom can help ensure you avoid expensive mistakes and end up with a quality product. For those producing podcasts on their own, check out Auphonic. Auphonic has turned years of professional audio experience into an inexpensive piece of online software. Their specialty is leveling audio and removing background hiss and noise, an audio producer’s two most important jobs. Before you record, have some fun: watch a cat video, laugh a little, do some vocal warm-ups. Think about the person you’re aiming to help and the problem you can’t wait to solve for them. Remember, audio equipment exists to enhance your message. Who you are and what you have to say is invaluable … the gear is just a method of transporting the gold. Special offer for Copyblogger readers only: Contact Toby on Twitter or at TwentyFourSound for a one-time, free podcast review. He’ll help you find the exact steps needed to match your audio to your voice. Toby Lyles is the owner of TwentyFourSound, an audio-production company for podcasts that reach multi-million-person audiences worldwide. The plosives were my major challenge until i got a pop filter. Thanks for sharing these tips. Steven, I appreciate that note about pop filters. Pop Filters are similar tiny homes, sometimes the smallest things make the biggest difference. I would say that some of the most important parts here would be having the right microphone (of high quality) and setting up your “studio” so to speak – in a quiet area where you can just relax and vent. You do need the right place to record your podcast shows. You hit some great points and great advice! I’ll disagree with your thoughts on condenser microphones. Many podcasters use em with no issues. They are NOT made for fancy studios – they are just microphones that need phantom power. Your suggestion of using the Focusrite Scarlett as an audio interface handles that just fine. Coaxing out good sound … again, this really isn’t an issue. Different mics do different things. Even the two you suggest will sound different, and you’ll have to do some different things (eq, placement, etc) to get good sound out of them. Condenser mics are no different. I love your passion for good sound. Regarding condenser microphones. I began recommending condenser microphones as well, they’re amazing. I’m simply pointing to the fact that because of the increased sensitivity, they more often pick up room reflections. I encourage the use of a condenser microphone, but remember the recording space plays a larger impact on the sound. After hundreds of recordings, I’ve landed on dynamic microphones because I want to give advice that a larger audience can quickly win with. If one is willing to invest in correcting their acoustic environment, I agree, there’s no substitute for a good large diaphragm condenser! Very Useful & Plain writing. Thanks for such an amazing tips. I purchased a nice microphone recently. I wasn’t planning to get a mic stand, as I don’t mind holding the mic in my hand, but now I’m strongly considering it. Because I somehow didn’t consider the fact that my new mic would (of course) pick up every little movement I made. Many of the sounds are minor and/or fixable, but ideally they just shouldn’t be there at all. I’m glad you’re finding the pop filter unnecessary. If your microphone position is communicating your message without a pop filter, you’re right to leave it off. Great stuff as always Toby! Especially that Zencastr tip. Maybe another bonus tip could be…when it sounds bad, send it to the professional editor. That is an especially informed comment. Thanks Brian! Nice post, Toby. I am planning to start podcasting and this post will be a nice addition to my research. Microphone selection and kind of recording space are quite important. I personally like Audio-Technica 2100 when it comes to microphone selection. Excited to hear about you new endeavors Rupesh. If you haven’t already, make sure you check out the Showrunner podcast. Jerod and Jonny give essential information on launching a podcast. Sure…. I will check out Showrunner podcast. Relevant to optimizing how your voice sounds, one easy to find resource I highly recommend to anyone who’s serious about doing webinars/podcasts/videos online is “Vocal Power” by Roger Love. Roger is a famous voice coach who’s helped Tony Robbins, Eminem, and many more super star celebrities to tap into the voice that is perfect for them. Thank you for all the suggestions here Toby!